Typically the only broccoli soup most people (aka I) like is something along the lines of Panera Bread’s Broccoli Cheddar Soup. Like growing up, how many times did you order that with a half a sandwich. Basically every time. So this soup is not that. It’s vegan, 90% vegetables, yet so so good! I have to say I surprised myself with this one. I was expecting a “meh” soup that I wouldn’t have put on the blog, but would have forced myself and Lou to eat because it was healthy. But this soup has amazing flavor. Thank you Dijon. Add the olive oil to a large pot over medium heat. Add the onion, carrots and a dash of sea salt and saute for 3-4 minutes. Add the garlic and saute briefly until fragrant. Add the dijon mustard and cannelloni beans, and mix through. Add in the broccoli, vegetable broth, water, and another dash of sea salt and pepper. Cover and allow to simmer for 15 minutes until carrots and broccoli are tender. Add the entirety of the pot to a blender, pour in the almond milk and blend until creamy. I can’t wait to try this! looks so thick and creamy! delicious! 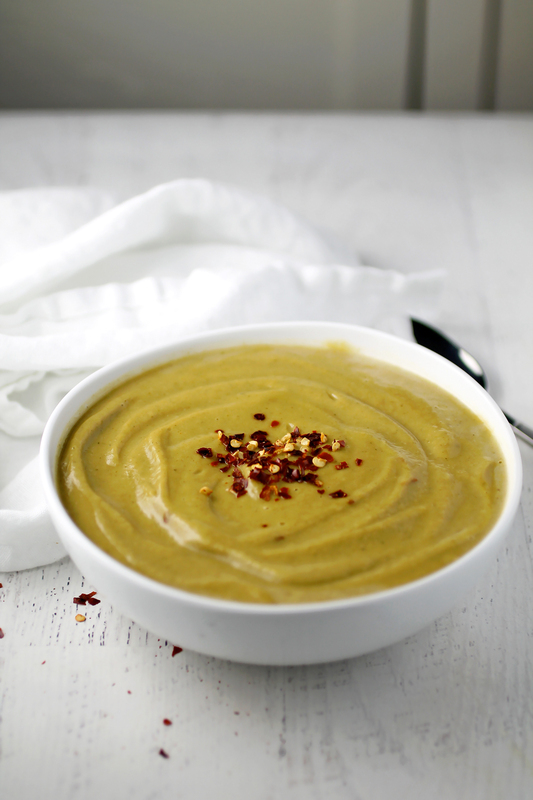 It’s soup season here with the snow falling and this sounds delicious! I like the sounds of adding dejon to broccoli soup. Yum! I love soup of all kinds and eat it all year round, but especially in the freezing cold of winter. I’m eating soup just about every day now. I’ll have to put this one into the rotation. Looks so good! There’s so much veggie goodness packed into this beautiful bowl! And those red pepper flakes look like the perfect finishing touch! 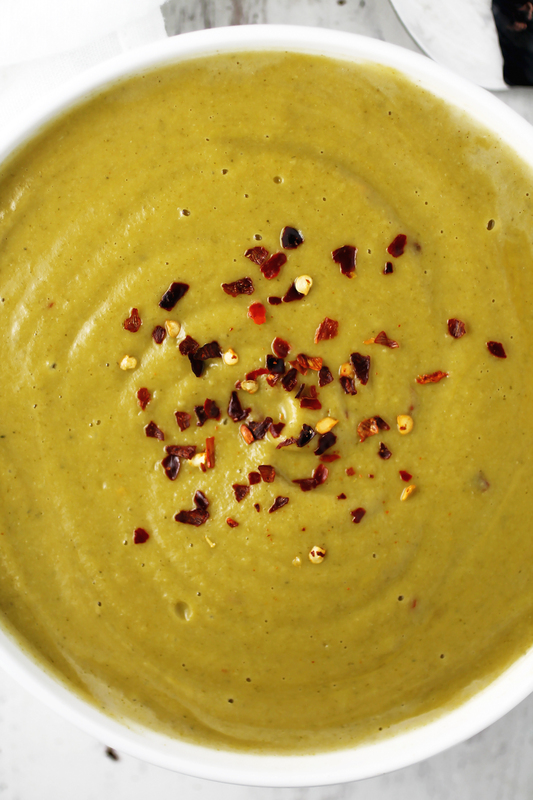 Do you have this soup in place of a dinner shake, during the clean program? 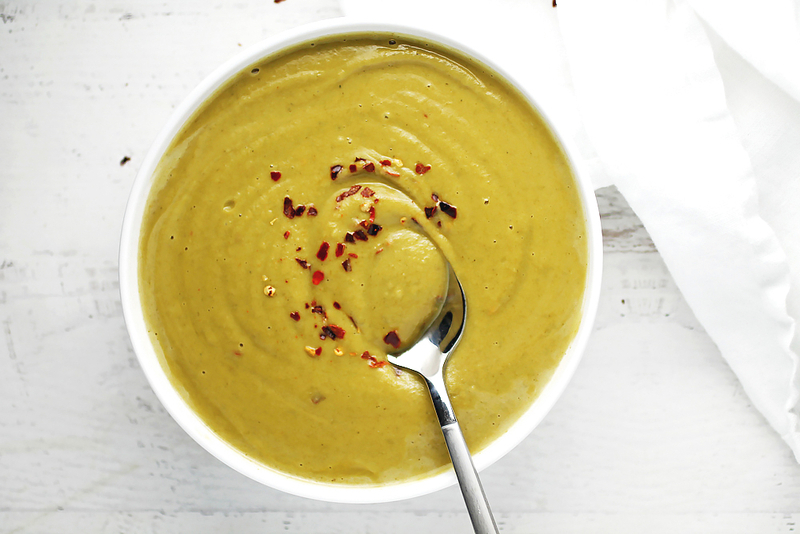 I’m a self-proclaimed broccoli AND Dijon addict, so this soup is just calling my name!! I love adding beans to soup for some delicious thickness and extra protein power! Love the yellow color of this! I am looking forward to trying this soup out! It looks so good! I love how creamy you made it look too! 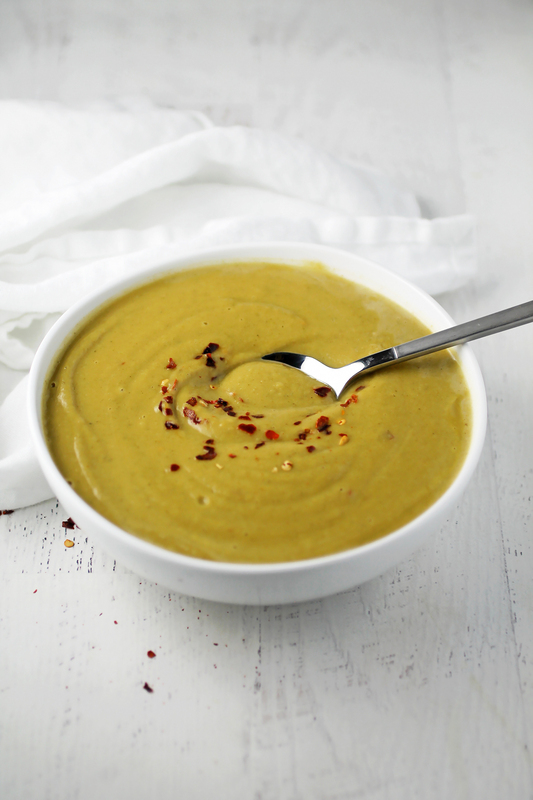 I love this plant based soup! I would never have thought to combine broccoli and dijon, sounds like an amazing combo! I just made the broccoli soup. It was very tasty but i think i added too much broccoli. I added 2 pounds which is 4 cups. But i think it was too much. Hi Cheryl, maybe it was the size of the broccoli pieces? This soup is on the thicker side, but shouldn’t be too thick. You can always add more both to thin it out while blending!